A Grandry corpuscle consists of two or more sensory cells or Grandry cells that enclose a discoid unmyelinated nerve ending (nerve disk) in between every two cells. 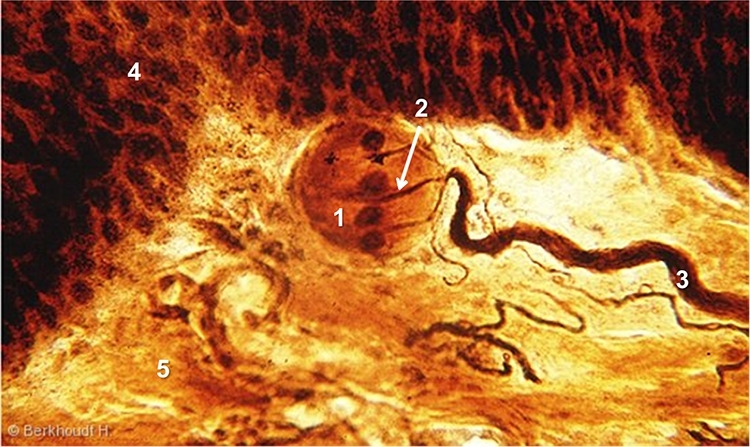 All nerve disks sprout from one myelinated afferent nerve fiber that enters the corpuscle at one pole. The nerve disks and Grandry cells always lie orientated with their flat surfaces parallel to the epidermis.